Honda305.com Forum :: View topic - How to run a CB77 without a battery? How to run a CB77 without a battery? If you take that old switch to a locksmith and show him the number on it he may be able to make you a new one. Ok so another question now :) Is it possible to go keyless? I need this thing "bare bones" think of XR80 style wiring bare bones..Kickstart only with a kill switch easy. I literally just need it to run haha. Any tips would be grand! Thanks again all. Slowly going back together. Waiting on motor parts and frame is coming back from paint this week! I have coils, two condensers the points setup, etc.. and a butchered up rats nest harness that I really don't want to use. The only thing keeping me stumped is what to do with the wiring from the stator..Being that there will be no lights at all I mainly just need to wire up my ignition system. Use the yellow and brown leads only,from the alternator, hooking up the light coils will put out more watts than needed and heat up the regulator circuit heat sink excessively. You could wire a kill switch in the wire, feeding the coils to kill it. Could also use a traditional style grounding kill button,wired to the points wire. Two sets of points so you would need to find a kill button with two wire connections. Use the yellow and brown leads only,from the alternator, hooking up the light coils will put out more watts than needed and heat up the regulator circuit heat sink excessively. Many years ago, a mechanic suggested a trick to keep my CB77 battery charged given the anaemic electrics on these machines. Turning on the headlight brings the extra coils into the circuit to help with the extra draw of the lights. If you turn on the lights but set the dimmer switch in the middle (a place it is not really designed to be) you essentially turn off both filaments in the headlamp but keep the extra generation capacity. I did this for quite a while without problem. Now that all of our magnets are getting a bit weak I doubt that permanently running all of the coils in the alternator will bring any grief and it will certainly help with battery charging. All awesome info. Being that my CB will only see track days I will be installing a Tusk Lighting Kit. It comes with a harness and rechargeable battery pack. I will be also installing a slim DRC Flex-1 tail light and a single flood style POD led light braced to the fork leg. 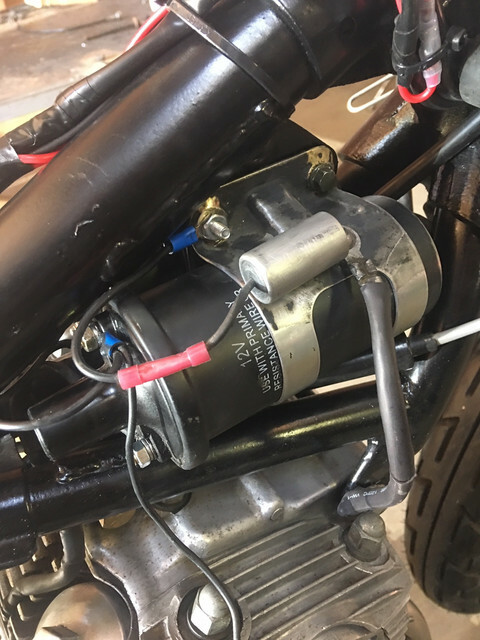 The wire battery pack will be able to be turned off/on with a throw switch and along with a front/rear brake switch and a kill switch. The only other wiring I will need to get together is for the ign. system. Hi, hoping to get a hand on this as I am severely struggling! I have attached pictures of what I am working with. I have no battery and no ignition key/switch. I am trying to keep this as limited as possible. 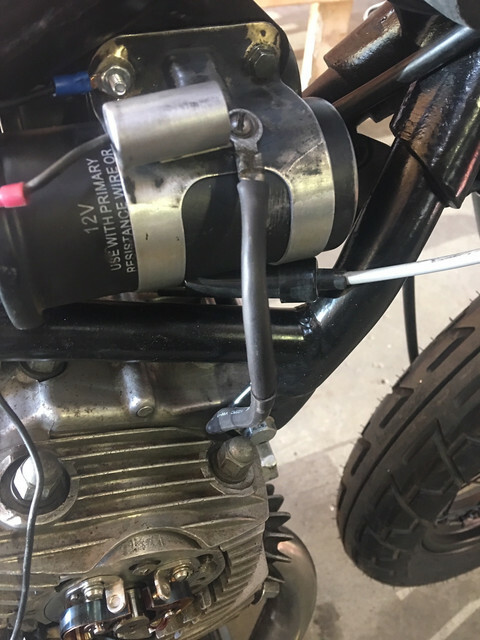 This bike has two small condensers instead of one big one mounted below the coils. You can see them on top of the coils. Each one has a single lead coming out of it. From the diagram these appear to just be grounded which I have done so to the coil mounts as you can see in the pics. From the points plate I have green to the right coil, yellow to the left. Both to the negatives on the coils. I see on the diagram there is a black lead from the coils that goes to the combination switch IG, which I assume is the "Ignition Ground" as of now my black lead is just hanging free as I have no switch or harness. Being that I have no switch or power source is that keeping me from spark? I also don't have any leads from the stator wired up as you can see which I assume I don't need to simply get spark? I have set the points gap at .012 with new plugs and new MSD coil wire. Not sure how old these coils or condensers are. I tried getting a reading but didn't come out to well on that..Will try again this evening! Thanks to all who can lend a hand on this! I really appreciate it!!! !